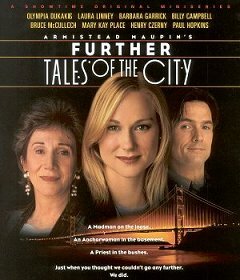 This is the third mini-series based on the popular stories and novels by Armistead Maupin, following the original Tales of the City (1993) and its sequel More Tales of the City (1998). The new films were produced by Showtime and filming in Sitka and San Francisco occurred in late July 2000.  Pacifica, San Mateo County: On 31 July 2000, a quick shot was done on Highway 1, just south of Pacifica.  City and County of San Francisco: From Friday, 28 July 2000, through Sunday, 30 July 2000, various scenes were filmed at Twin Peaks, Macondray Lane at Taylor Street, and Golden Gate Park's Conservatory of Flowers (John F. Kennedy Drive and the Dahlia Garden), the Fern Tree Forest, Rhododendron Dell / John McLaren Memorial, Steinhart Aquarium, and Geary Boulevard near the Coronet Theater.  Sitka, Sitka Borough: In late July 2000, the crew filmed in the streets of Sitka, including in front of the Russian church. Read the original novels by Armistead Maupin!  "Thrice-Told Tales..." San Francisco Chronicle, 31 July 2000.